30-day guitar challenge: Pick up some new ideas in the style of this multiple Grammy Award winning blues legend with five fully tabbed examples and two bespoke backing tracks. 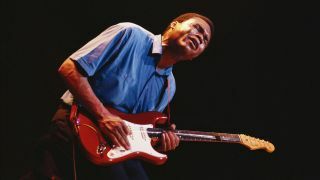 Robert Cray takes a no-frills approach, playing a vintage ‘hardtail’ (non-tremolo) Strat through an almost clean amp with a heavy pick attack and aggressive vibrato. This results in a distinctive style that he partly attributes to having spent many months touring the US in support of Albert King during the mid to late 70s. Though he is known for his distinctive, piercing solo phrases, Robert is also (in the great blues tradition) lead vocalist of his own band and a prolific songwriter. Though he has tried many different amps over the years, he keeps his signal path pretty clear between the guitar and amp. Cranking vintage valve amps isn’t a home-friendly option for most of us, so it’s worth bringing an overdrive pedal into the mix, with a splash of reverb - and a little bit of compression. He likes to use a bright sound and the compression works for smoothing some of those peaks that jump out of the mix, especially when using the bridge or middle pickup selection. As said, Robert is most identified with the Strat, but any style of guitar can sound convincing. With humbuckers, add a little high end then trim bass, gain and compression to stop the sound getting too thick and distorted - though that is fun too! Using the middle pickup, heavy picking attack and a little overdrive to simulate a ‘pushed’ clean amp, this example stays within the ‘shape 1’ A minor pentatonic scale. Notice the ‘rake’ across the top strings at the beginning of the phrase. This adds extra volume and thickness to the sound, helping it stand out in the mix. Moving around the A minor pentatonic scale (A C D E G) again, this time we’re taking a more spread approach, rather than staying in one register. The brief flurries of picked notes add a little excitement - don’t allow these to distract you from the overall feel, they don’t need to be super accurate to do the job. Moving to the higher reaches of the fretboard, the E and G notes are allowed to ring together while adding a little vibrato - a very traditional blues move that goes way back to Robert Johnson. It can be tricky working in the smaller space up here, but if you take your time, it will become second nature. This shows a little of Robert’s Albert King influence: A minor pentatonic with a little bit of F# (major 6th) added to sweeten. If this seems tricky at first, just rehearse the movements until you feel more confident, then plug back in. There is no ‘trick’ to this - a confident attack is all that’s required. Changing to the bridge pickup with the same amp/pedal settings gives this sharp, cutting tone. A little compression can help smooth the more jagged edges of a tone like this, helping it sit in a band mix. Though this is faithfully transcribed, don’t feel too bound by strict timing - in fact, pushing and pulling a little against the tempo gives very authentic results.